This photo (from the 1920's?) 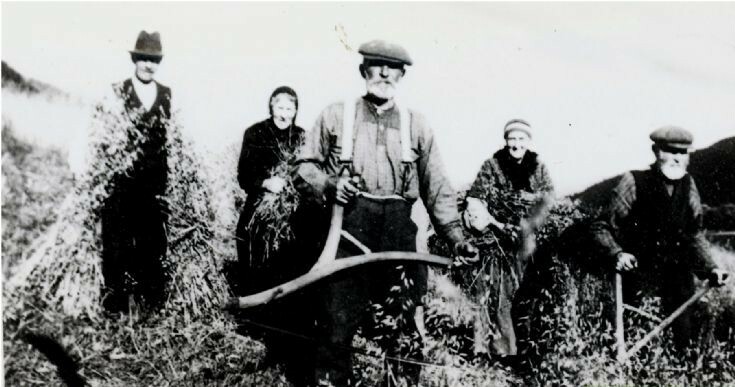 of elderly folk working on the harvest was taken on the fields of Dalrossick Farm, just below the Bridge of Buchat. It was stated that they were all over 80 (or 90 - can't quite remember) and still working on the hearst. The man on the left was a retired policeman, living at the Post Office house at the Bridge of Buchat? The man on the left would be George Matthew, my grandfather. He was born 1866, so younger than the others.